75th Anniversary Carved wooden book..
A school local to us is celebrating their 75th Anniversary.. I had heard that they were celebrating by doing all sorts of events, like dressing up in 1940s clothing, an open day for former pupils to come and look around, and other things to get the kids involved with. I was sort of asked / volunteered to go in..
A few days later, on the morning, I had got all of my tools ready to go. 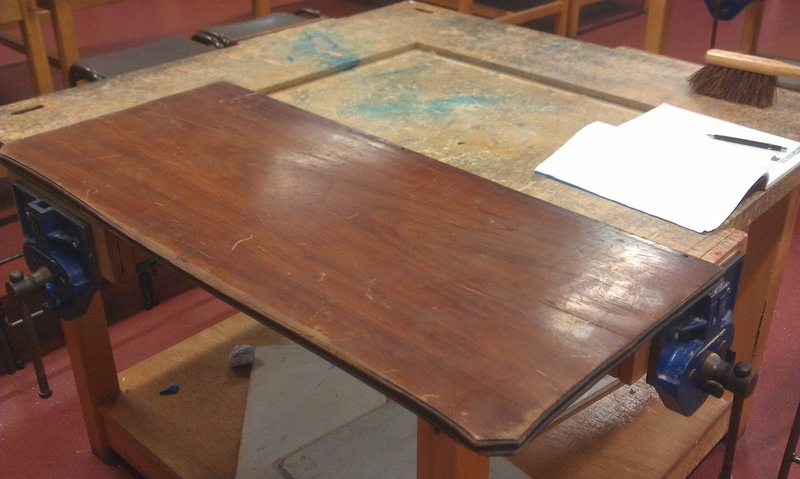 And an old dressing table top in Mahogany to use for this piece. I found it in a skip, in reasonable condition but with a split either end for the first 9" right in the middle of the top.. So here's that top before I cut into it.. So 9am arrives and the children start coming into the DT room, one class at a time.. So this is my sketch, which I did in front of the children. So they get the fact that there was no preparing of parts for this event.. So I cut it down the middle, then cut an end off. Then started shaping the inner parts of the pages. So After the build up.. The design, the timber, then the very busy build weekend, which was great.. The long wait..Votes counted up..and the winner is..
Well... follow this link between the < > to < Chris Wongs site > ..and all will be revealed..
Great results, thanks to the guy's who made the stools. Their wives and girlfriends for putting up with us all going on about it for weeks.. to the list of sponsors, who made it even more exciting. Huge thanks must go to Chris Wong who started this whole build.. cheers Chris. and to those of you who voted.. 750 brilliant.. Stunning... Italian Olive wood country built bed..
A great start to the year.. When I went to see this bed, a few months ago, it was quite a lovely sight to see. The timber is Olive wood and has a beautiful patina, with lots of knots dug out and replaced with small pieces of Olive, in the most simple of ways, that just looked great..and it's heavy..much heavier than you think as you go to pick it up. The bed has been in the same family for three generations, and there was no way that it was going to be ruined in any way.. The family came to my workshop to see what I do, and what I could do for them. I must admit, at first I got the wrong end of the stick, I was being asked if I could just extend it by 300 or so millimeters.. You just can't add 300 mm to the length of a bed, especially if a teenage boy is the user.. unless I added some more structural timber inside.. So I mentioned cutting the sides down to use as fascia covers over new longer structural rails..this didn't go well either.. I loved doing this one.. I was working away in the shop as per usual..not sure what on, but I noticed a couple in my Gallery area..and they were getting what I do, can do etc. Within a few minutes Ben, Sarah and I were chatting about something they would like made for his parents. And from what Ben was saying I was beginning to come up with some great ideas.. This was going to be a really cool piece. Ben wanted the house name, with a date of his parents Ruby wedding anniversary carved into it. 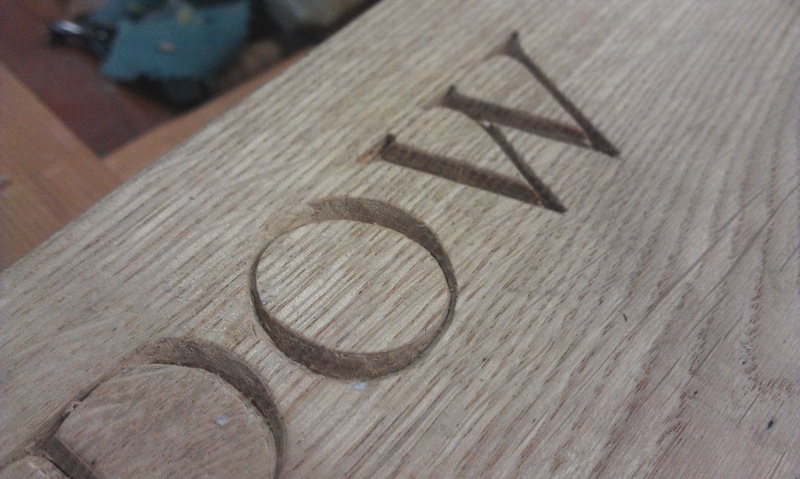 After a few texts..Ben came one evening with a beautiful piece of English Oak 7" x 7" and about 7ft long..
We talked about where the letters would be carved and how it would look.. So I asked Ben to go and think about it, then type out exactly what he wanted, the height, width and I'm not quiet sure who came up with the idea... maybe because we were on the same wavelength it just happened..
A piece of glass in ruby red, let into the post. So now we were getting somewhere..